Swansea University scientists working at CERN have published a study detailing a breakthrough in antihydrogen research. The scientists were working as part of the ALPHA collaboration which is made up of researchers and groups from over a dozen institutions from all over the world, with the UK contingent led by Swansea University's Professor Mike Charlton. 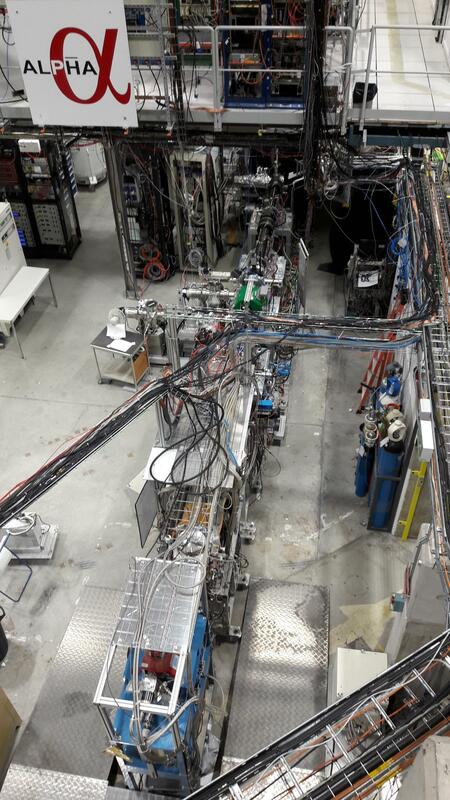 The research, funded by the EPSRC, was obtained using apparatus at the Antiproton Decelerator facility at CERN, and has been published in the Nature journal. The ALPHA team experiment shows how the scientists improved efficiency in the synthesis of antihydrogen, and for the first time succeeded in accumulating the anti-atoms, which has allowed for greater scope in their experimentation. Professor Charlton said: "When an excited atom relaxes, it emits light of a characteristic colour, the yellow colour of sodium street lights is an everyday example of this. When the atom is hydrogen, which is a single electron and a single proton, and the excited electron decays to the lowest energy state from a higher one, the discrete series of ultraviolet light emitted forms the Lyman Series, which is named after Theodore Lyman who first observed this over 100 years ago. "The presence of these discrete lines helped to establish the theory of quantum mechanics which governs the world at an atomic level and is one of the corner stones of modern Physics. "The Lyman-alpha line is of fundamental importance in physics and astronomy. For example, observations in astronomy on how the line from distant emitters is shifted to longer wavelengths (known as the redshift), gives us information on how the universe evolves, and allows testing models which predict its future"
This experiment is the first time the Lyman-alpha transition – when the hydrogen electron transitions between the so-called 1S and 2P state, emitting or absorbing UV light of 121.6 nm wavelength – has been observed in anti-hydrogen. Antihydrogen is the antimatter counterpart to hydrogen, and is comprised of a single anti-proton and a single anti-electron with the latter particle also known as a positron. For this experiment, the physicists accumulated about 500 antihydrogen atoms in the trap. If they did nothing, they could hold these atoms for many, many, hours without loss. However, by illuminating the trapped atoms with various colours of UV light, the team could drive the Lyman-alpha transition and excite the antihydrogen atoms. These excited atoms are no longer trapped within the apparatus and, being comprised of antimatter, promptly annihilate with the surrounding matter of the equipment and are detected. This observation is significant as it is yet another test of a property of antihydrogen that is in good agreement with that of hydrogen. It is also a key step towards the production of ultra-cold antihydrogen atoms, which will greatly improve the ability to control, manipulate and perform further precision studies on the anti-atom. "While studies have continued at the Antiproton Decelerator facility at CERN, further refining these measurements and using the techniques to improve our understanding of the antihydrogen through spectroscopy, the ALPHA team will be modifying the apparatus in order to study the effect of Earth's gravity on the anti-atom. The next few months will be an exciting time for all concerned." The Physics Department at Swansea University is ranked 13th in the UK and best in Wales in the Guardian University Guide, 2019. Based at our Singleton Park Campus, our students benefit from a £4.2M investment in lab facilities and social learning spaces. Our students voted us as the 2nd best Physics department in the UK in the 2018 National Student Survey, with a satisfaction score of 97%. Students are taught by world-class academics, who are active in research areas such as the trapping of anti-matter. The Department has close links with CERN and there are opportunities for students to visit and take part in CERN-based projects and research activity.